“The Town” is by far one of the best movies of the year. It’s a clever, well directed film, with a solid cast and story; I couldn’t ask for more. I loved Ben Affleck’s directorial debut “Gone Baby Gone”, but he outdid himself here. What’s more, he gives an amazing performance in the movie’s leading role as a longtime thief who falls in love with Claire (Rebecca Hall), a bank manager connected to one of his earlier heists. What makes “The Town” a great movie in my opinion is the fact that Affleck’s character is torn between his love to claire, and his loyalty to his lifelong partners. But he also has to deal with an FBI agent who wants to bring him and his crew down. You might think that there aren’t any new ways to picture bank robberies, car chases and even gun shootouts, but “The Town” is here to prove you wrong; every scene is amazingly well crafted and gripping (we owe it all to Ben Affleck and his cinematographer Robert Elswit). 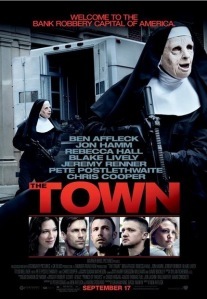 Most of the movies playing at the multiplex right now are either junk or instantly forgettable, “The Town” is a rare exception, and I really hope it gets the audience it deserves. Well done Mr.Aflleck. U made me wanna watch this movie! Hope I like it. Loved it. Like I said: I hope it gets the audience it deserves.